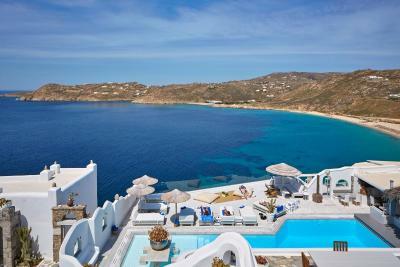 Lock in a great price for Greco Philia Hotel Boutique Mykonos – rated 9 by recent guests! Special thanks to all the staff of this wonderful hotel, because of their kindness and respect. Really liked the location despite of being far away from the town because it was very calm plus being near Elia Beach which is in my opinion the best beach in Mykonos for no doubt. The facilities was very good too. Worth visiting it again ! Loved this place!! We visited for our baby moon; my husband and I arrived with me 7 months pregnant and the staff treated us like gold! Great rooms, great views, great food! I cannot scream enough how wonderful this hotel was! Amazing boutique hotel. The staff will do everything to make your stay great. Special mention to Cristos and his recommendations. Spent our honeymoon. Will go back for sure. Beautiful view on Elia beach and the sunset! The hotel has a nice traditional architecture with every room being different. Staff is helpful when asked but do little proactively. The staff and the views are really what made this stay great. Hotel driver was waiting for us at the airport and we were greeted by Evita who couldn't have been lovelier. The hotel is a collection of villas and rooms on the side of a hill. Our 2BR villa (The Raphael) overlooked Elia Beach and had 3 balconies with great views. The pool area is very nice and we dined at the hotel for several meals. Food was good and our waiter was comical. We did not rent a car and glad we did not. Streets are very narrow, tourist drivers a bit erratic. Whenever we needed a ride to beach, a club or to the port, it took minutes for a hotel driver to arrive at our villa. There is a transfer fee 30-45 Euros but so much better than a taxi or stress of driving a rental car. The view, the layout, the friendliness of the staff. It was perfect!! I like everything about this hotel it was better than I expected. My room named Rembrandt was perfect, very confortable and beatifully decorated, the view from the terrace was amazing. The brekfast served near to the pool area was excellent. Amazing hotel with gorgeous views and surroundings. Beach is a free shuttle ride (or downwards 5 mins walk) away, it's beautiful and amazing - most of it isn't free though, beds available for 20-30 euros a day. Breakfast and the staff at the restaurant was great. Loved the view, Elia beach is superb, the pool facilities were awesome and my room was lovely! Great place to escape and have some rest and relaxation. Would certainly return. 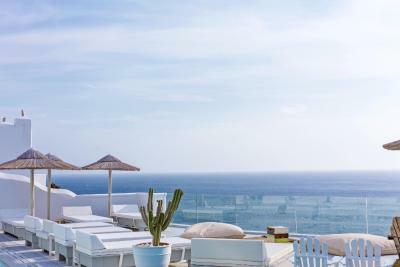 Greco Philia Hotel Boutique Mykonos This rating is a reflection of how the property compares to the industry standard when it comes to price, facilities and services available. It's based on a self-evaluation by the property. Use this rating to help choose your stay! 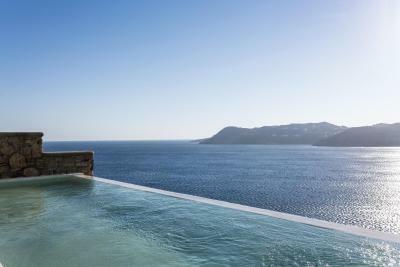 Set on the cliffs above Elia beach, Greco Philia Hotel Boutique offers exclusive accommodations with magnificent Aegean Sea views in an ultra-relaxing and luxurious setting. Guests can laze around the sparkling waters of the pool and enjoy breathtaking views over the sea. The pool bar offers refreshing drinks while guests can relax by the pool. The hotel's Spa offers aesthetic treatments, spa packages and integrative therapies designed to enhance guests' wellness experience. 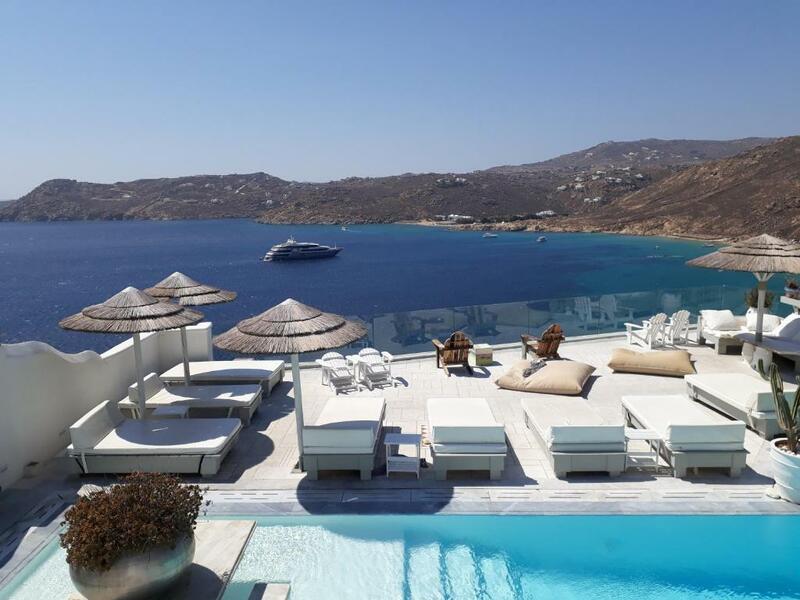 All stylish suites and spacious villas at Greco Philia Hotel Boutique Mykonos offer magnificent and unobtrusive sea views and feature comfortable beds with hypo-allergenic mattresses and pillows. Flat screen TVs with CD/DVD player, free Wi-Fi and seating areas are included. Guests are greeted with a welcome cake and a fresh fruit basket. A tasty breakfast is served each morning and is available until noon. 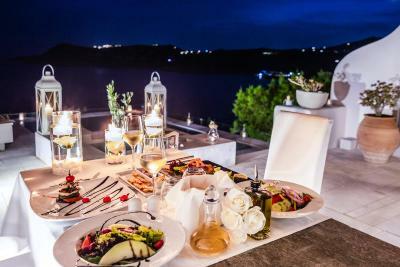 The award-winning chef prepares Mediterranean dishes with fresh seafood and organic vegetables, and guests enjoy their dinner while taking in the views of the sea. The hotel concierge and front desk will be happy to recommend restaurants, arrange dry cleaning and ironing service, car hire and more. 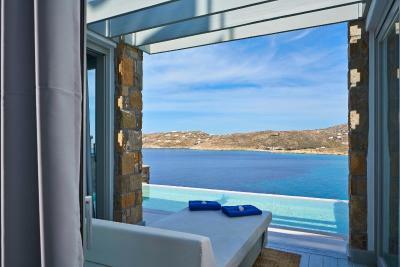 When would you like to stay at Greco Philia Hotel Boutique Mykonos? -bathrobes, slippers and beach towels. Please note that suites differ in size and decoration. 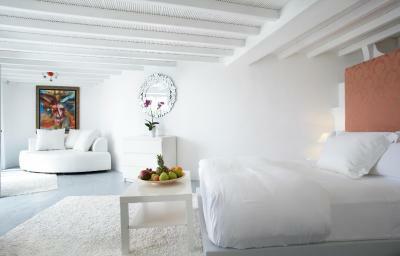 Uniquely decorated luxurious suites with panoramic view of the Aegean Sea. 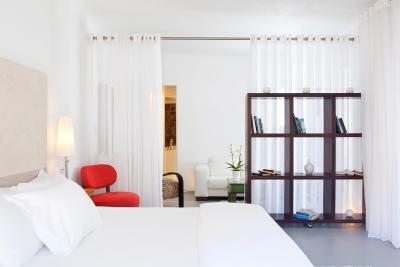 All suites are equipped with luxury mattresses, bathrobes, signature bath amenities, beach/pool towels and slippers. Please note that suites may differ in size and decoration. -bathrobes, beach/pool towels and slippers. Some units also come with an outdoor private hot tub. All Junior Villas differ in size and decorations. 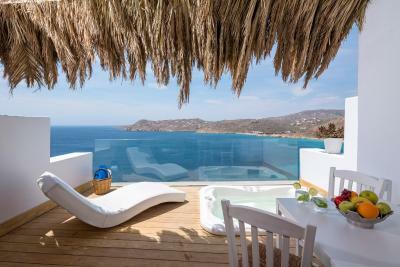 Set at the edge of the cliffs, this suite has a spacious bedroom with sofas, a stone-built bathroom and a secluded veranda with unobstructed views of the Aegean Sea. All our suites differ in size and decorations. Located at the edge of the cliffs, this villa has panoramic views of the Aegean Sea. 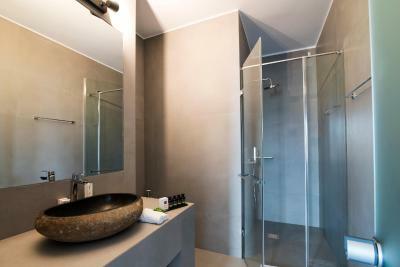 There is a a bathroom with luxury walking-in shower and mosaic-tiled walls. A sun bed is available at the spacious veranda. Please note that villas differ in size and decoration. All our One Bedroom Grand Deluxe Villas are differ in size and decorations. This villa has panoramic sea view, private parking space, a private entrance, a living room and 2 separate bedrooms. Standing on the edge of the cliff, this villa features panoramic sea views and has a large furnished terrace with hot tub. This villa offers 2 separate, uniquely designed suites with private bathrooms. It opens out to a spacious veranda of 230 ft² with sofas, design chairs and a private pool. 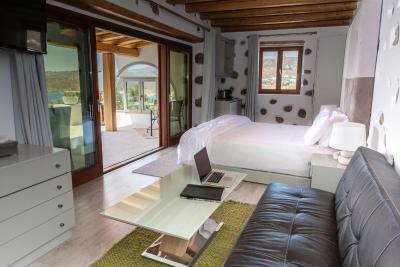 This villa consists of 2 separate, uniquely designed suites with private bathrooms. It opens out to a 150-m² veranda with a large bar, sofas, design chairs and a hot tub for 4. 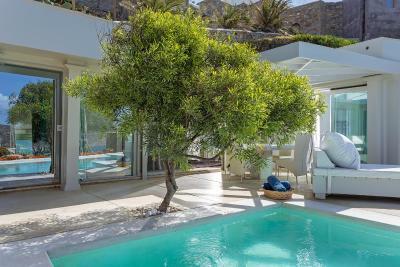 Featuring a private infinity pool with views over Elia Beach, this modernly decorated, stone-built villa comes with 2 bedrooms, a living room and a stylish separate guest house. 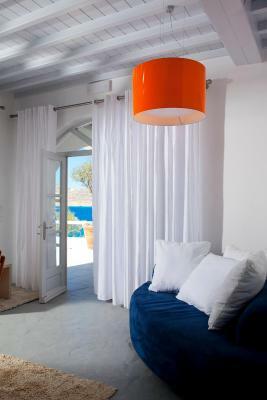 House Rules Greco Philia Hotel Boutique Mykonos takes special requests – add in the next step! Greco Philia Hotel Boutique Mykonos accepts these cards and reserves the right to temporarily hold an amount prior to arrival. Our room was very large and comfortable. The access was a bit difficult considering it is located on a hill. 1. Pool was too cold, colder than the sea. 2. Be aware that buses connect to Mykonos town only until 19:25 and there is not much to do at Elia except one nice restaurant at the beach - this means that you always have to stay in or take a taxi ride (40 euros) to Mykonos and back every night. 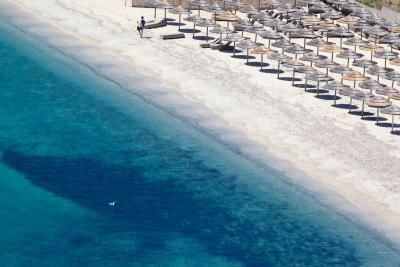 Hotel should provide free shuttle buses or access to the ones operated by the neighboring Myconian hotels. I hired a car to explore the island as location is remote which I wanted but transfers around are expensive. We were upgraded to Leonardo room that was spacious and offered great sea views and a jacuzzi. The staff was very friendly and always smiley. The breakfast was rich and delicious! A great getaway for couples and families away from city with beautiful sunset over the hills facing west looking down on the Elia beach. The staff were friendly and very welcoming. Enjoyed staying here however you'll need to rent a vehicle to go exploring other beaches. The bar tender niko and the waiter nicholas are absolutely amazing. Really enjoyed our conversations gave us helpful tips of where to go and made every effort to accommodate us Very good hearted and genuine people. There's notting that disappoints me. But when you have difficulty to climb the hills it will be more difficult to get to your room and the other fasilities. With the exception of my remark you will be amazed about the view over the bay off Elia, It's stunning. Great hotel in every way. The breakfast was the best ever I had in a boutique hotel. The staff is very friendly every time of the day :) If you want a relaxing holiday this hotel is absolutely recommended. I’ve spend there 4 wonderful nights and days! The hotel is in the very scenery place - laid on the cliff, quite a steep walk bu foot (but the hotel car is always at the service to take you up and down). The view from the restaurant/swimming pool and the rooms is breath taking! Place is cozy, stylish and very clean. The staff is amazing! Very friendly and helping. All the time smiling and making your stay even better. I also enjoyed the restaurant - the prices are very reasonable, same as in the rest of Mykonos. Food good and the cocktails great - even old fashion which is quite difficult to make right. I am already planing a return, hope to manage even this summer! Thank you!